"Old fashioned, made from scratch strawberry shortcake." Mix strawberries and 1 cup sugar in a bowl and allow to stand while you complete remaining steps. Stir occasionally to help juice form. Preheat oven to 350 degrees F (175 degrees C). Grease an 8-inch round baking pan. Combine flour, 2 tablespoons sugar, baking powder, and salt in a bowl; cut in shortening with a knife or pastry blender until the mixture resembles coarse crumbs. Stir milk into crumb mixture until just blended; pour into prepared baking pan. Bake in the preheated oven until a toothpick inserted into the center comes out clean, 15 to 20 minutes; cool in the pans for 10 minutes before removing shortcake. 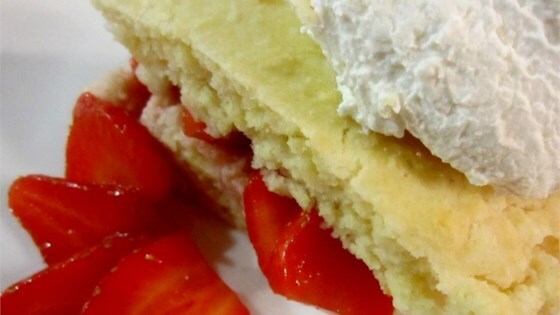 Split shortcake into two layers; spread bottom layer with 2 tablespoons softened butter and top with strawberries and juice. Place top layer over strawberries. Serve with whipped cream. This was delicious and very easy to make. People were licking their plates. Thanks for posting this recipe.